Time spent working with natural and sustainable materials is good for the soul and the satisfaction of creating something of beauty that can be used on a daily basis is hard to beat! 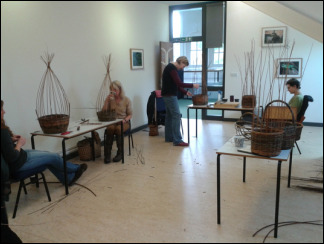 Workshops and longer courses take place at The Welshmill Hub in Frome, The Walled Garden at Mells. Also at the Cheese and Grain in Frome for Frome Community Education, these are ongoing and run on a half termly basis on a Tuesday morning 10 am to 12.30 pm. For details about specific baskets that can be made please click here and for information on garden structures and fencing click here and anything else click here! Private sessions can be arranged at a venue of your choice. Please contact me to discuss your requirements. Sign up to my newsletter to be kept informed of further dates and new workshops. If none of the dates are suitable please contact me to register your interest, I may be able to work something out. A half day workshop is approximately 3 hours long. The morning session runs from 10 am to 1 pm and the afternoon session runs from 1.30 pm to 4.30 pm. The cost is from £35 to £50 depending on the venue and includes all materials and refreshments. A full day workshop runs from 10 am to 4.30 pm. The cost of a full day workshop is from £65 to £90 depending on the venue and includes all materials and refreshments. A 4 week course that runs on a Tuesday morning from 10.00 am to 12.30 pm. This is incredibly good value at £50 for the 4 weeks. This course should be booked and paid for through the Cheese and Grain booking office which is where the course is held. There is a small charge of £3.50 per week (£14 for the 4 weeks) for materials which is paid directly to me. The next course starts in September to make the framed berry basket. Followed by 4 weeks of 'festive' weaving. We will make a wide range of items from a small festive tree to stars, a platter for your mince pies and a few other things. Find more information on specific baskets here. These courses are generally held at The Welshmill Hub and cost from £25 to £90 depending on the length and type of the course, this includes all materials and refreshments. Please see booking page for dates and information on specific baskets click here. If you are interested but the day of the week does not suit you please get in touch as the following course could possibly be held on a different day.